Discussion in 'MacBook Pro' started by pyroo, Nov 22, 2009. This is why mechanical aptitude is suggested for someone trying to do their own upgrades. Your picture does not work either. I was referring more to the decision to rip it out. There are easy ways to get a stripped screw out that don't involve jerking, ripping, twisting, or tearing on a $1000+ computer. 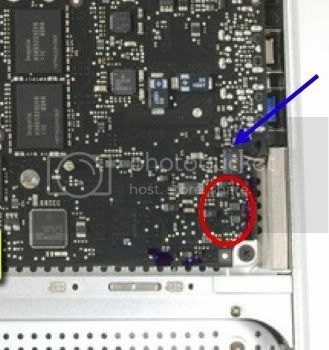 The connector is for one of the speakers, and the little square dudes are resistors on the logic board. Just for future reference, if a screw is not coming out, and it's connected to something delicate, don't force it. Find someone skilled in working with screws and such and get them to help. wow you managed to knock resistors off the logic board??? and your computer still boots, your lucky. But my guess is when you use whatever component that uses those resistors will either not work or completely fry something else/ the whole motherboard. When I replaced the stock HDD of an early 2009 unibody Macbook Pro 17" I stripped or scratched the heads of two screws. I guess they are not stripped because they were successfully removed and successfully put back in their old place, but the black head of the screw is obviously scratched and turned white or silver in some places. So if I ever need a repair or to have it looked at, I understand it is best to put back in the stock HDD, but now there is obvious evidence that even if the old stock HDD is in its original place, the HDD has clearly been replaced. Is this even an issue if I asked to get something like the LCD screen checked or replaced? I went on ifixit looking for these screws but was unable to find them on sale. Could you please post a link if you find a place to purchase replacement screws for the HDD slot. First of all, start your own threads for your questions. It's considered rude to 'hijack' another's thread to ask something. The hard drive is considered a user-replaceable part. Leave it in if you need service.